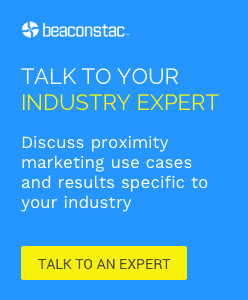 Beacons and apps are a ‘power couple’! The reason is simple: iBeacon need apps to recognize their unique identifiers and facilitate their associated interactions. And apps need beacons for real-world context; to deliver the mobile experiences at the right time and the right place. When iBeacon technology integrates with apps – they have the potential to create magic! In this post, we will discuss apps from different domains that stand out due to their features, ease of usage and the user interactivity they enable. Called ‘Placed’ earlier, this is an app used to trigger other apps. ‘Launch Here’ allows you to automate tasks on your iOS devices. The way it works is – you can place multiple beacons around your home, and when you approach a particular beacon, the Launch Here app will trigger the relevant app associated with that beacon. For example, when you sit on the couch in front of the TV, a TV remote app can launch. A beacon on the fridge can trigger a shopping list app as you approach. Launch Here is the fastest way to launch an app tied to a spot at your home – a timer when you’re next to the coffee maker, or a to-do app at your desk. As soon as you are nearby a placed beacon and you turn on your lock screen, the app of your choice will appear as notification and you can launch it with a simple swipe. BeHere, was created by a company called Beelieve – a small team of developers based in Brazil. The app comes with a new angle for iBeacon technology: taking attendance in the classroom. The app turns a teacher’s iPad into an iBeacon that automatically identifies students as they enter the classroom with their iPhone, or iPod touch also running the same BeHere app. The best feature of this app is that students can use it as a medium to ask for the teacher’s help, once the class begins. All they have to do is just press a button on their phone. The teacher then sees all such requests in a queue and can respond as needed. Students’ profiles can also be connected to Facebook, allowing BeHere to include a profile picture, too. The app reiterates the broad potential for iBeacon technology, outside the retail environment. Proximitask is an app that acts as a missing link between reminders on your phone and beacons in the real world. Similar to how iOS’ Reminders app allows you to trigger reminders based on location and proximity, Proximitask app allows you to trigger them based on beacons. The app, best used in enterprises works like this: beacons placed around employees’ desks are used to quickly remind the employees about their tasks for the day. Moreover, with iOS8 enabling beacon-triggered lock screen notifications employees can access their to-do lists with a single swipe off the lock screen – without having to receive repetitive push notifications. This is a welcome change to what was the case earlier – where employees could be reminded only once, via a push notification. The Mingleton app encourages people to be more social in real life settings. It does this by allowing one to discover what he/she have in common with the people around, and then try to know them. The app lets one ask someone to meet, anonymously. This way, a person will be both less afraid of rejection and more open to being social, the two interested people are notified only if both want to meet each other. This is one of the best apps in the sports domain with some excellent features. When a user loads the app on the way to the stadium (20 ballparks are beacon-enabled), it immediately identifies the stadium he/she is enroute to and starts populating information specific to that one. Once near the entrance, it displays the barcode of his/her ticket and directing him/her to the relevant seat via a map while also highlighting the nearby points of interest. If the tickets were purchased online using Apple Passbook, the app even pulls them up automatically. The app also grants other benefits such as offering directions to the shortest lines, both at the entrance and at the concession line, where he/she is trying to purchase a hot dog, for example. The stadium uses beacons to send out coupons and promotions for nearby vendors. It also allows teams to track the visits made by their fans thus enabling them to reward fans with special coupons and discounts for their frequent visits. Event Base is a great event managing tool. It integrates with iBeacon technology to better connect with attendees through instant push notifications. It displays personalised suggestions and content to its user. An interesting feature of this application is that it provides 24/7 attendee support through an intelligent chatbot. NearBee is a lightweight, free application that seamlessly integrates with beacons to broadcast notifications on iPhones. It does not require any user action in order to display notifications on the user’s screen. Additionally, Nearbee isn’t tied to any particular hardware. It works perfectly well with any Eddystone beacon that provides an Eddystone URL frame. We have also launched NearBee for Android with non-passive, rich notifications that provides relevant content to the end-user. Crowd Compass is a very useful event planning application that helps planners manage beacons on-site and thereby communicate more effectively with attendees. Attendees can receive important and relevant push notifications during the event about important alerts instantly through beacons. It also offers features like live polling, Q&A and surveys, to keep audiences engaged constantly. Event2Mobile is a great solution to drive engagement in events and conferences via beacon based messaging. From media sharing to attendee matchmaking, this application can really enhance the effectiveness of networking events and other social gatherings. In addition to real-time polling and live Q&A, this application provides navigation services where attendees can get directions within the venue. Like Nearbee, Locate Beacon can be used to locate and identify beacons in proximity. It is compatible with Eddystone, iBeacon as well as Altbeacon formats. It provides push notifications based on campaigns broadcasted through Bluetooth beacons. These are the best apps in my opinion. Do you know some other beacon-enabled apps that make the cut? Let us know in the comments below. iBeacon is one of the latest technologies to look out for. For more insight on related technologies, get in touch with BrainMobi – Leading Mobile App Development Company.